carriewriterblog: Marketing Monday: Thumbs Up for Dice's "Next Tech"
Marketing Monday: Thumbs Up for Dice's "Next Tech"
Welcome to my 2nd installment of "Marketing Monday," where I look at marketing case studies from my own experience and rate them, as either "thumbs up," or "thumbs - eh - not so much." When I first received my invitation to the Dice Next Tech event earlier this month at the Mountain View Computer Museum, I wasn't quite sure what to expect, as I had never been to a Dice event before. 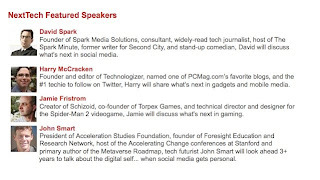 To be honest, I hadn't heard of the panelists, but the premise intrigued me - what did the future hold for social media? Technology? Gaming? The panel presentations were quite varied, and really had me thinking about what the future holds. David Spark was awesome in his discussion of the "Rise of the Super User," and talked about the importance of blogging and commenting on other blogs in order to gain recognition and visibility in social media. He had a lot of great examples, including superusers who had gotten jobs by showing their passion for companies and creating a buzz of their own. Sarah Evans, for example, recently joined the online pr social media site Pitch Engine thanks to her online presence and passion for the company. Video: David Spark talks about privacy online, and how social media is all about perceived value. It's amazing what people will give away about themselves, just for a discount or a coupon, he comments. *Harry McCraken discussed cool new innovations in gadgets and mobile, including what he predicts will be the upcoming trend in augmented reality, growing cloud- based systems, 3D, and the increasing popularity of "e-paper." *John Smart discussed the "tablet of the future," which will in his view include a remote for interactive tv, an e-reader, a video viewer, and a notepad/clipboard device. John's question of the night was: "Will your cybertwin finish your sentences when you're having a senior moment?" This was related to his concept that computer of the not too distant future will finish your thinking for you when you're away. Ok, I'm good with that! 1. Nice giveaways, and the fuzzy dice was a great idea. I was walking around with mine and several people asked me where I got them, so there was definitely good "buzz" on the fuzz. 2. Good food and nice selection. I liked that there was a separate bar area that didn't get too crowded, and the food, assorted fruit and cheeses and some hot appetizers, was tasty. 3. Marketing the Marketer: Dice was smart to video interviews of folks on their way out about their impressions of the event. Here was my take on things on video. 4. Dice really thought about how the audience would view things and set up an additional screen in the back of the room, which I really appreciated. I could walk around and not miss anything, and take photos off the screen without bothering anyone. 5. Content-wise, clearly a lot of thought was put into the panel and it showed. 1. There was not much time for networking built into the program. I would have liked to see a mini expo after the event, where participants could linger and network with each other as well as with vendors and even employers, since Dice is about employment in the technology sector, after all. 2. That brings me to my second point, about the job thing. At times, it seemed like the audience might have been a tad mismatched with the presenters. During a questions and answer session at the end, some audience members seemed disatisfied and I'm not sure if they wanted more of a direct fit in terms of the job scene. Also, there were times when the speakers themselves when asking for a show of hands on certain topics, were perplexed that no one quite knew what they were talking about, particularly in the gaming department. So, I'm wondering how the audience was selected/invited and that's maybe something Dice needs to look at for future events like this. 3. Pre-and post event social media buzz lacking. I think Dice could have done more to build up buzz on this event. On the invitation, for example, there was no Twitter hashtag to invite participants to start talking up the event, nor an invitation to join a Dice Facebook or Linked In group. There was also no request for participants to Tweet during the event. They might have gotten a better turnout by trying out these tools, although it seemed like a good attendance. There was also no evaluation form at the end of the event, which would have given Dice immediate feedback for next time. Granted, they had the videos going on, but some people like to give their opinions anonymously. 4. Giveaways not great for branding. Dice had a lot of great giveaways at the end, but the prizes promoted other companies and not them. They also had some fun swag on the way out, like pens and such, but t-shirts (and it's not just cause I love t-shirts) would have gone a long way in their branding, and people go nuts over them. 5. Dice was using this occasion to launch its new user interface in beta, where job seekers could have a deeper interaction with employers. Since the event ran fairly long, the momentum was a bit lost by the time they announced it. Perhaps taking a brief intermission in the middle of the event would have been better timing for the announcement. Also, when I got home and wanted to check out the new program for myself, I couldn't find it. There was no banner or highlight taking me to the new program. All in all, congrats to Dice for this event, and I'm keeping my eyes open for technology breakthroughs of the future, although I'm not sure I can envision a "cybertwin" for myself, although if there is one, maybe she can cook dinner, and also write the occasional blog post?